CAPE COD, Mass. – To no one’s surprise, the Cape Cod Baseball League has given the B.F.C. Whitehouse Award to a pair of dominating athletes. Shaun Seibert (Arkansas) of the Brewster Whitecaps and Terry Doyle (Boston College) of the Y-D Red Sox both pitched remarkably well over the course of the summer, earning them shares of the 2006 Pitcher of the Year title. Pitching a perfect summer at 6-0, Seibert was the league leader in both wins and ERA. 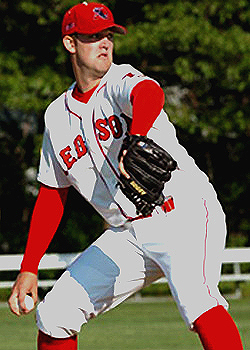 Allowing just 26 hits in 46 innings pitched, Seibert displayed incredible command and earned the start for the Eastern Division at the 2006 All-Star Game. Ending the season with a 0.39 ERA – good for the third best ERA in the modern era of the Cape League – Seibert was featured as the winning pitcher in Game 1 of the Eastern Division Playoffs, throwing six strong innings against the Red Sox while allowing just four hits. The opposing pitcher in the game was his co-Pitcher of the Year, Terry Doyle. Doyle ended the summer among the league leaders with five wins and was second in strikeouts with 52. Featured in eight starts, Doyle’s regular season highlight was a 12-strikeout no-hitter of the Chatham A’s on July 16. In addition from his Game 1 start in the divisional playoffs, he led the Red Sox to victory by pitching four perfect innings to begin his winning effort over the Wareham Gatemen in the decisive game of the CCBL Championship Series. Out of Illinois, Seibert was a rising star and recruited heavily during high school. Both at the plate and on the mound, Seibert performed well among his league’s best. Posting a 19-2 record with a 0.51 ERA while striking out 180 during his four-year high school tenure, he earned All-State honors in 2003 and a preseason all-American nomination in 2004. As a freshman at the University of Arkansas, Seibert battled an injured elbow that caused him to miss three weeks of his season, but he was still able to prove himself with a 3.60 ERA and a 5-3 record. Predicted as one of the top pitchers in the rotation in 2006, Seibert earned the ticket to the CCBL and couldn’t have been happier. Out of nearby Warwick, R.I., Doyle excelled in both baseball and basketball at an early age. While pulling double duty a captain of the basketball team at Salem (NH) High, Doyle was named pitcher of the year in 2004 in the NHIAA conference and was voted team MVP in his final two years of high school. In his freshman year at Boston College, he posted an earned run average of 3.14 and was among the conference leaders with 66 strikeouts over 57 innings pitched. When awarded the trip to the CCBL after a strong sophomore season as the ace of the BC rotation, Doyle was both delighted and anxious to prove himself once again.